Strong winds and rain can knock a nearly ripe buckwheat crop off the plant. If the crop is windrowed and placed on high stubble it weathers the storm better. Hurricane Isabel passed through buckwheat country on September 19th, just as harvest was beginning. For crops nearly ripe but not quite ready for direct cutting, the decision making is difficult. Tom McConnell of West Virginia Cooperative Extension got over 4 inches of rain from the storm. Unfortunately, that just felt like more of the same after the constant soaking rain this summer. Through the summer, buckwheat has stood up better than many other crops. Isabel weakened as it headed north, with relatively little damage reported in Pennsylvania. The storm faded to a depression over Butler Co., PA as it headed to Lake Erie. The 2003 Northeast Buckwheat Field Day was held in Batavia, NY on August 19th. It was hosted by ACDS Research, the managers of the New York Crop Research Facility. Manager Jeremiah Smith wanted to use buckwheat to restore tilth to a field that has been used for vegetable research plots. We had the good fortune to be able to use that field for Field Day demonstrations. On display were Manor, Manisoba and Koto. All had grown about equally well, but the attendees saw more enlarging fruit on the Koto planting. That evaluation of seed set was the result of Thomas Björkman’s workshop through which growers were able to identify the first branches to make seed, and later ones higher and lower on the plant. Where to look on the plant makes a big difference in seeing whether the set is good. The seed at the top of the plant is some of the last to appear. This kind of examination is useful for determining whether heat blasting has really reduced yield, or if there is an extra large crop on the way. A large part of the afternoon was spent on soil quality. Improving soil quality is the objective that puts buckwheat in many growers' rotation. Alan Erb of the Cornell Cooperative Extension Lake Plains Vegetable Team spoke about many aspects of soil health. He is a participant in Cornell’s Soil Health work team that is assessing soil health at cooperating farms across Western New York. We were able to see the dramatic effects that soil compaction had on the buckwheat stand. By digging small pits, Alan was able to deduce what practices had caused the compaction in the stunted parts of the field. He also emphasized buckwheat’s benefits for aggregate stability, weed control, and reducing erosion. 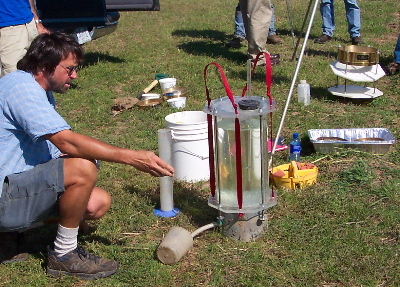 Bob Schindlebeck of Cornell’s Department of Crop and Soil Sciences demonstrated their new optimized instrument for measuring aggregate stability. It is one of the important measures that the Soil Health work team is monitoring on farms. It tends to respond fairly quickly to changes in management. In tests on the demonstration plot, there were no measurable effects on aggregate stability after 5 weeks of buckwheat growth. It doesn’t change that fast! For testing aggregate stability, the device "rains" on soil on a screen (left), and mud runs through the screen if it is not in stable aggregates. The aggregate stability test will soon be available from the Cornell soil testing lab, so you can do your own before-and-after comparisons. The field day handout is available here. Jack Kenney of AgriCulver says that they are evaluating its performance in New York. If the performance is as good as expected, they anticipate having enough for commercial sales by next season. This new buckwheat variety is a selection from a cross among Manor, Mancan and Manisoba. It is somewhat earlier and shorter than its parent varieties, and has a longer flowering period. Its yield has been better than the parents in Ontario trials. The seed is smaller than the type contracted by Birkett Mills, so they will not buy this variety. Growers interested in this variety need to have a different market. In addition to buckwheat grains, expected uses include cover crop and bee forage. Canadian production is expected to be down for 2003 due to a 23% decrease in seeded area (to about 23,000 acres). Canadian stocks are expected to be completely depleted. World supply is forecast to drop 4% to 2.56 million tons. Ag Canada forecasts a price increase from CDN$7.05/bu (=US$8.20/cwt) last year to CDN$7.50/bu (=US$11.00/cwt) this fall. The exchange rate has increase the US dollar price further. Buckwheat is helpful for weed control. One of the ways it suppresses weeds is through allelopathy. Allelopathy is the production of chemicals by one plant that are toxic to its competition. The identity of the first such agent, diethyl phthalate, was discovered by Seokhyun Eom in 1999. Now a report from Tsukuba, Japan has revealed a new set of compounds that act as allelochemicals. Two of these alkaloid compounds (piperidine and piperidene methanol) have never before been identified in plants. These agents stop root growth in newly germinated weed seeds. The scientists, lead by chemical ecologist Yoshiharu Fujii, found that these compounds were present at significant levels in the shoots of buckwheat. They have not yet tested the roots. If the compounds are only present in the shoots, they will only work after buckwheat is cut as a green manure or after grain harvest. These compounds were particularly effective at inhibiting common amaranth. It is closely related to redroot pigweed, which is one of the few weeds in Northeastern buckwheat fields. Perhaps buckwheat residue somewhat suppresses the germination of redroot pigweed. The compounds were also fairly effective on barnyardgrass. White clover and mustard were moderately sensitive and crabgrass relatively insensitive. This work is helpful for understanding how buckwheat inhibits weeds. Buckwheat is already commonly planted for weed suppression. A better understanding will let growers use it more precisely on particular weeds and in the most effective way. Iqbal, Z., Hiradate, S., Noda, A. Isojima, S-I, and Fujii, Y. 2002. Allelopathy of Buckwheat: Assessment of allelopathic potential of extract of aerial parts of buckwheat and identification of fagomine and other related alkaloids as allelochemicals. Weed Biology and Managment 2: 110-115. The Preston County Buckwheat Festival will be September 25-28 in Kingwood, WV. It is sponsored by the Kingwood Volunteer Fire Department. For details, see the website at www.buckwheatfest.com. This is the only buckwheat festival in the Northeast. Buckwheat cakes will be available from 8 in the morning to 6 in the evening every day of the festival. They are all made with buckwheat grown in Preston County and leavened overnight with yeast. Additional forage tests were made on buckwheat this year by Thomas Björkman. Earlier trials showed that by the time seeds are beginning to brown, the protein drops (along with the leaves) and the fiber gets too high. These tests were done much earlier, at the onset of flowering (35 days after sowing) and just before the first seed turned brown (55 days after sowing). These were both 35-40 inches tall on a moderately fertile field. The amino acid composition of buckwheat is better balanced than most other forages, so the effective protein value may be a little higher than is indicated by the crude protein assay. In the earlier trial, by the time brown seeds formed, the CP was down to 8.8%. The NDF (42.6%) and the IVTD (72%) remained about the same. It is probably all right to let a few seeds begin to brown without losing feed value, but the DM yield will not increase that much. The reason is that nutritionally valuable leaves are falling off and less-valuable seeds are making up more of the weight. Buckwheat forage would have value for dairy farms where a missed first hay cutting leaves them with inadequate forage and little time to make it up. It is also being investigated for deer forage plantings in areas where wildlife managers are trying to improve the nutrition of the deer herd. I have reported here on the progress that USDA is making towards providing crop insurance for buckwheat. In the meantime there is an alternative. Pete McCray of Sherman, NY reports that he has had his buckwheat crop covered through USDA Adjusted Gross Revenue coverage. This insurance guarantees a portion of your gross income. Insurance paid off this year when continuous rain left him unable to plant any of his buckwheat acres. This program is available through your regular insurance agent. It requires 5 years of farm records and enrolment by the January deadline. Thanks to Ira Kleinman and his Restaurant, Food and Travel Show for a fabulous radio magazine about buckwheat in the Finger Lakes that was broadcast to the metropolitan New York area.